Wee! 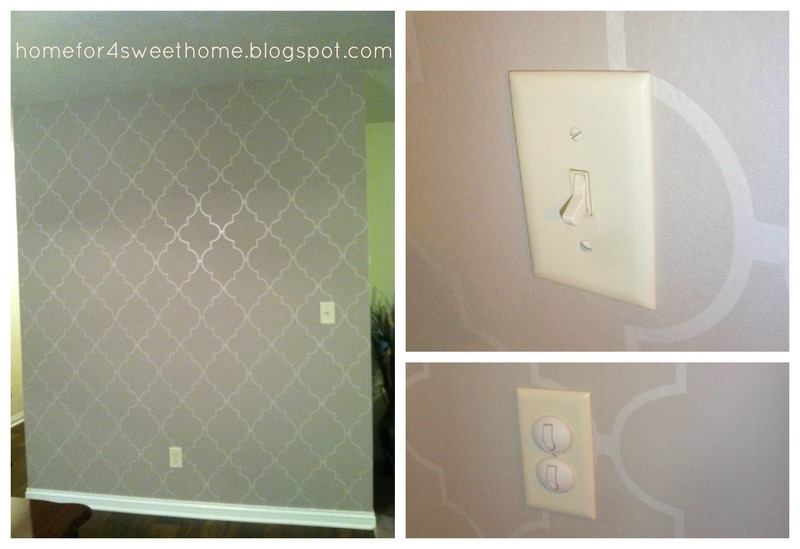 I am just beyond giddy about announcing my first wallpapering experience!! Here you go! My first ever wallpapering project!! So love it!! The pattern is just so elegant & modern that it makes my dining area have that feel too. I can't stop looking at it when it was done, it has the pearly-kind-of-sheen-or-shimmer on it. Here's a closer look so you guys can see what I am trying to say. Okay, let's go to the deets of this project. I purchased two rolls of this wallpaper from Lowe's online, it definitely does not look the same on their website. Picked it up, went home and opened it, then I noticed that the colors are not the same! eekk!! The other one is kind of beige-ish and the other one is kind of gray-ish. 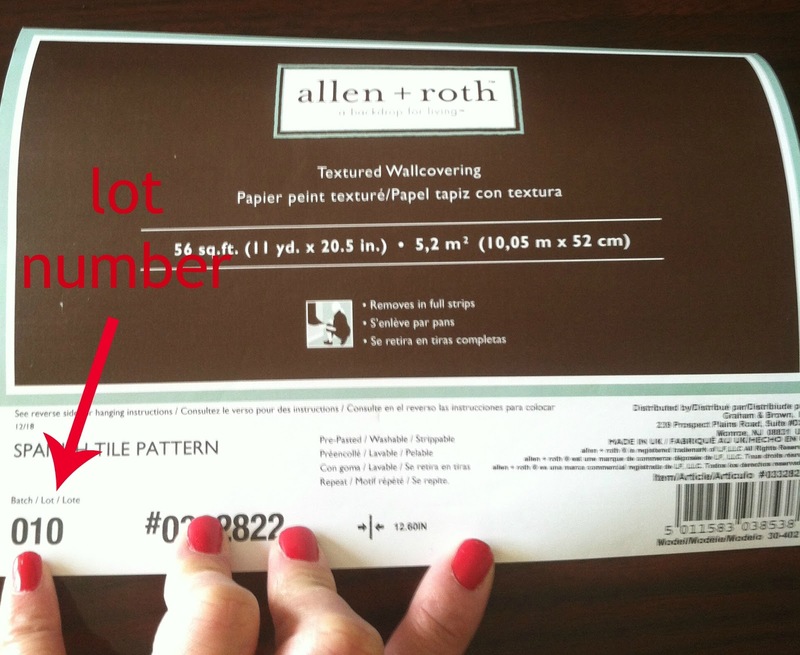 Well apparently, lot number is very important when you're working with wallpapers. The beige-ish roll had a 002 lot number and the gray-ish roll had the 010 lot number. Duh! Okay, like I've said this is my first wallpapering job...does that explains why I don't know about lot numbers? 1) Then I measured the height of my wall, this is the wall before the wallpaper was applied. 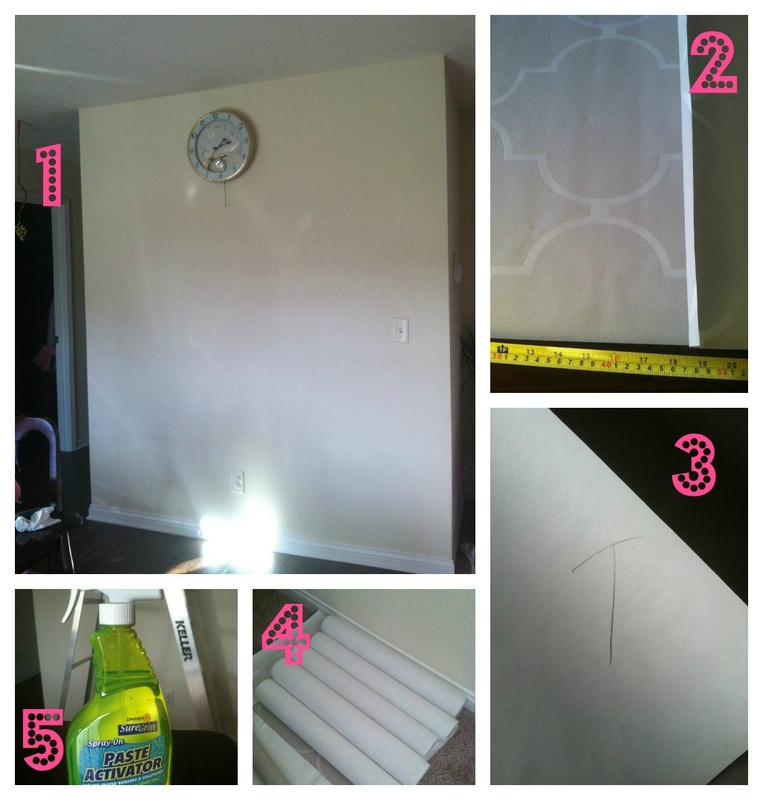 2) Cut the wallpaper to the size of the wall with 3 inches extra on both ends. 3) Wrote "T" for top on the back of the wallpaper where you want to be on top. 4) Based on the pattern, I cut 4 more of the wallpaper size - so I have 5 total rolls. 5) Since this wallpaper is prepasted, I just used a paste activator to activate the adhesive. Note: Instructions may vary, so follow your wallpaper application instruction. Activated the first roll, then book it, hang it and here's how the first roll looks like on the wall. When I saw the first roll on the wall, I was so pleased :) that I did the happy dance!! woot!woot! Did the same to the second roll, make sure that your pattern is aligned with the first roll & that it butts up to the first roll. Here's how it looks like with two rolls on the wall. Pleased? then do the happy dance again!! woot! woot! And then take a picture of yourself using your phone doing that with your left hand even if you're right-handed...just so you have a funny picture for your readers!! lol! Looks good Rea! I wish I have the time and patience to put wallpaper in our house. Haha..Maybe I will hire you? Ha! then my husband helped me out when he got home on the last roll because it was a little tricky to do the last one..
Wow. That is a stunning transformation. I love everything about it. I've never wallpapered before so I appreciated your tips! thank you Angelica :) i love the pattern and the sheen on it too.. Your wallpaper is really lovely! It's amazing what a difference it makes. Great job! thank you, yeah i'm really glad i did it...the dining room area looks awesome now! Hi Brittney! I'm so glad you linked up with Fun Friday and for following me, thank you so much! Hope you have fun blog hopping and see you next Friday! I'll try my best to make your visits worth your time...on my way to check your blog! thank you for linking up with Fun Friday! and for following!! Have fun and see you next friday! That came out really fantastic! A+ job! yay! thank you, thank you Rosie! i like A+ :) i'm doing the happy dance!! woot!woot! I'm glad to see you back on our 2nd week of Fun Friday Blog Hop! That wallpaper is GORGEOUS! You did an amazing job--I could never do this--I just know that stuff would be stuck to my fingers like fly paper. It really lends an elegant flair to your home! thank you! 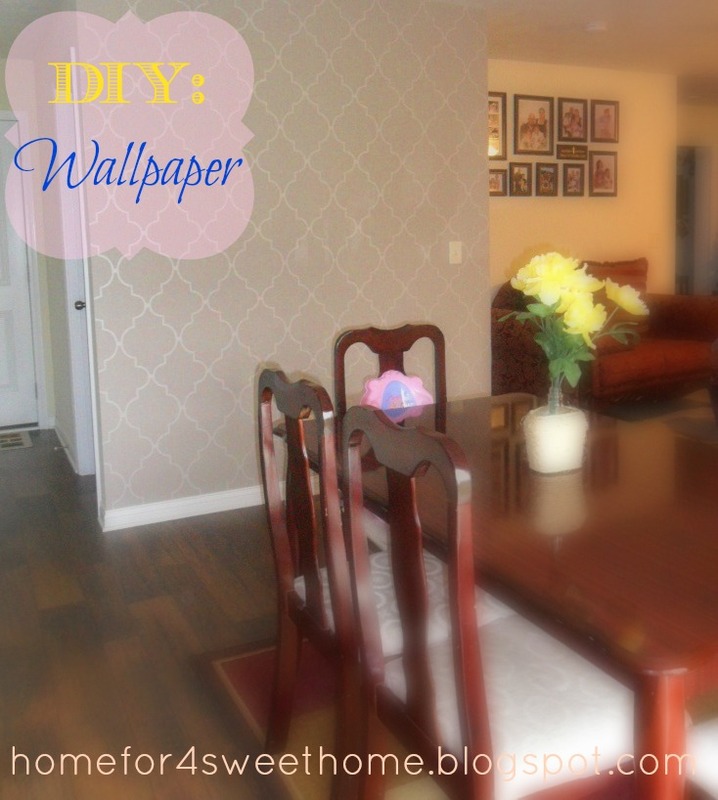 it was my first wallpapering project and it was not as difficult as i thought it would be..i think will be wallpapering again :) you should try it-you can do it! I am your newest follower and was hopin' that you'd pop on by my blog (which is currently under construction so don't mind the missing photo, etc), hang around and follow me back! I'm not a huge fan of wallpaper, but this looks really good! This turned out so well you just might have started something. :D I remember my first wallpaper fiasco. I had to learn the hard way too. I really like this look and although I swore off wallpaper after having to remove so much of it in our current home, you have me reconsidering. i am in LOVE with that wall design! If i had the time (and patience) i would do that in my home aw well! Now that wallpaper is not as hard as I thought it would be, so you can definitely do it! you should try! Hope you'll stick around and see you next time.. I love the design on the wallpaper, so classy! i'm glad i made you laugh Cristina! that was my whole intention! lol! really, most of the time when i'm on a project nobody ever take a picture of me while in action :)ah! i should hire an assistant, jk! Rea!! You made me laugh. I do the same thing. I take a photo of my left hand doing the project and I'm right handed...LOL Your wallpaper looks great!! haha really denyse! maybe other bloggers have their own photographers while they're in action...sometimes, it makes me giggle to imagine looking at myself taking a picture of myself! Thanks for linking up at Throwback Thursday. glad to join your linky party!